It has been suggested that this article be merged into List of armed conflicts involving the United States. (Discuss) Proposed since February 2019. This is a list of wars fought by the United States of America. 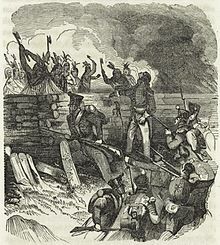 Shays' troops are repulsed from the armory at Springfield, Massachusetts in early 1787. 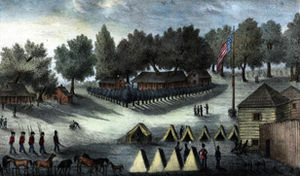 George Washington reviews troops before their march to suppress the rebellion in western Pennsylvania. Location: Mediterranean Sea off the coast of Tripoli. 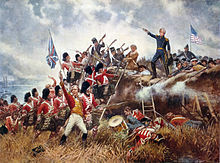 General Andrew Jackson stands on the parapet of his makeshift defenses as his troops repulse attacking Highlanders, by painter Edward Percy Moran in 1910. Location: Mediterranean Sea and the Barbary states. The Battle of Antietam, by Kurz & Allison. 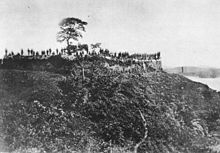 Capture of a Choshu battery at Shimonoseki by British sailors and marines. Chōshū pays an indemnity of $3,000,000. 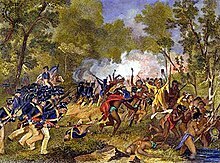 US Marines and Sailors attack Formosan pirates. 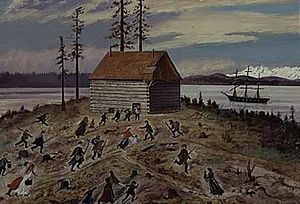 Battle of Beecher Island. 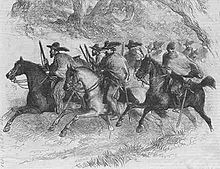 One soldier and three horses have fallen, while others continue to wage the battle. 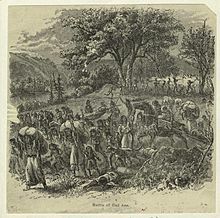 Engraving of soldiers recovering the bodies of the slain May 3, 1873. 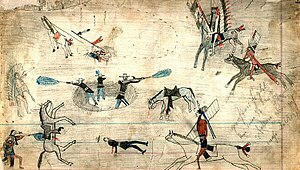 Custer's last stand at Little Bighorn. 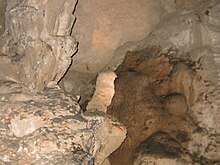 Aftermath of the Battle of "The Pit." 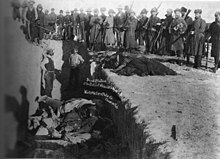 Mass grave for the dead Lakota after the conflict at Wounded Knee Creek. 10th Cavalry soldiers holding Yaqui prisoners at their camp in Bear Valley, January 9, 1918. 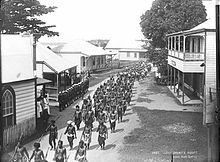 Samoan warriors and American servicemen during the Siege of Apia in March 1899. 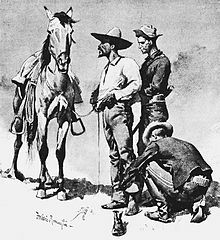 Teddy Roosevelt and the "Rough Riders" charge Spanish positions during the Battle of San Juan Hill. 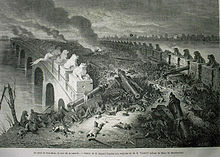 Kurz & Allison print of the Battle of Quingua. 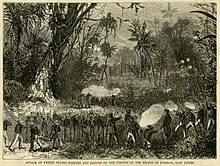 The 8th Infantry Regiment defeat the Moros in the four-day battle of Bagsak Mountain on Jolo Island in the Philippines. Corporal Titus, of the 14th Infantry Regiment, scaling the walls of Peking. Mexican Constitutionalist faction leader Venustiano Carranza recognised as the sole leaders of the Mexican government by the U.S. 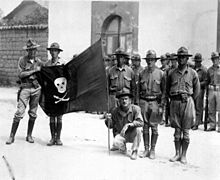 US Marines holding a captured Sandinista flag. Installation of a US-backed Somoza dictatorship in Nicaragua. 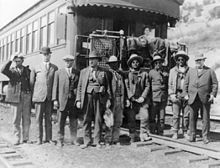 Prisoners of the Bluff War in Thompson, Utah, waiting to board a train for their trial in Salt Lake City. 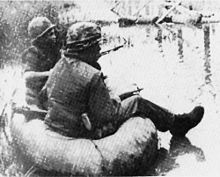 US Marines in the Occupation of the Dominican Republic. Two US troops pass by dead German soldiers on a battlefield. US troops march through Russia before the Battle of Romanovka. Ute and Paiute prisoners of war. 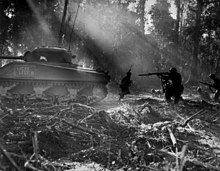 U.S. Army Soldiers advancing at dawn in the cover of a M4 Sherman tank, during the Battle of Bougainville, 1944. 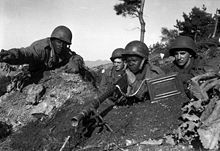 American soldiers in the Korean war with the Browning M1919A6 LMG. US forced out of North Korea by China. Subsequent United States invasion of North Korea repelled and defeated. A U.S. Air Force Bell UH-1P from the 20th Special Operations Squadron "Green Hornets" at a base in Laos, 1970. Establishment of the Lao People's Democratic Republic. US Marine sits in a foxhole and points his machine gun toward Beirut. 1st Cavalry Division, Battle of Ia Drang, 1965. Amnesty declared on 23 April 1980 by the Thai government. Order 66/2523 signed by Prime Minister Prem Tinsulanonda. Communist insurgency declines and ends in 1983. ROK and US troop stationed at the DMZ, 1967. 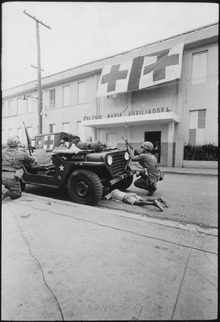 US soldiers push a child underneath a Jeep to protect him during a firefight in Santo Domingo on May 5, 1965. 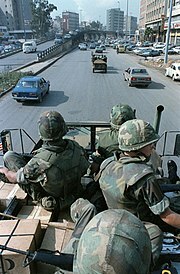 US troops and tanks entering town in Cambodia. 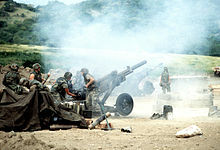 American soldiers in mortar positions in Grenada. Failed Libyan Scud missile response. Iranian frigate Sahand after being attacked by U.S. aircraft. 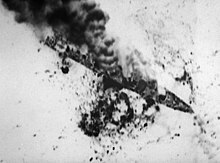 U.S. Navy vessel USS Vincennes shoots down civilian Iran Air Flight 655 killing all 290 passengers, among them 66 children. Iran-Iraq war ends in August 1988 following UN-brokered ceasefire. 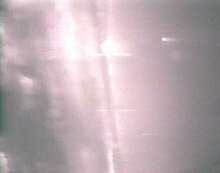 Gun camera depicting the last remaining MiG-23 fighters exploding after being shot down. 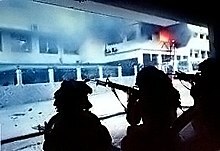 U.S. troops prepare to take a neighborhood in Panama City, December 1989. M1 Abrams tanks of the 3rd Armored Division advance on Medina Ridge. A Tomahawk cruise missile is fired from an Arleigh Burke-class destroyer during Operation Desert Fox in December 1998. US Marines on patrol in Somalia. Russian and American troops on a joint patrol around the Bosnian town of Zvornik on the afternoon of 29 February 1996. High Representative for Bosnia and Herzegovina established to implement the peace agreement. 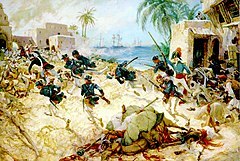 US troops arrive in Haiti. al-Qaeda training camp in Afghanistan. ^ Advisory role from the forming of the MAAG in Vietnam to the Gulf of Tonkin incident. 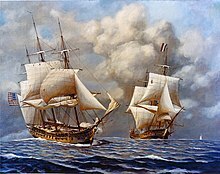 ^ Direct U.S. involvement ended in 1973 with the Paris Peace Accords. Air Force and Special Ops continued some operations until April 1975; President Ford in a televised speech on April 23, 1975 declared the end of Vietnam War. 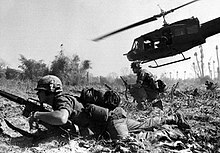 ^ The war reignited on 13 December 1974 with offensive operations by North Vietnam, leading to victory over South Vietnam in under two months. American and British soldiers take a tactical pause during a combat patrol in the Sangin District area of Helmand Province. 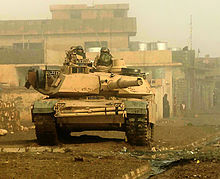 Soldiers from 3rd Armored Cavalry Regiment conduct security before a cordon and search operation in Biaj, Iraq with their M1 Abrams Main Battle Tank. MQ-9 Reaper commonly used in covert drone strikes in Somalia. A tall plume of black smoke rises from a destroyed pirate vessel that was struck by USS Farragut in March 2010. 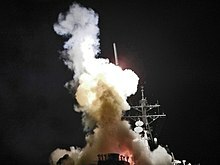 US vessels launch missiles in support of the Libyan Civil War. U.S. Marine Sgt. 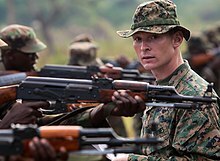 Joseph Bergeron, a task force combat engineer, explains combat marksmanship tactics to a group of Ugandan soldiers. LRA leader Joseph Kony remains a fugitive. Heavy damage caused to ISIS forces resulting in losses of about 40% of its held territory by 2016, and by December 2017, its remaining strongholds were destroyed leaving small pockets of fleers. 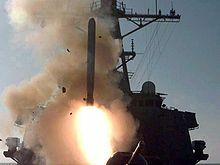 USS Ross fires Tomahawk missiles towards Shayrat Military Base, during the 2017 retaliatory strike against the Syrian government. U.S. 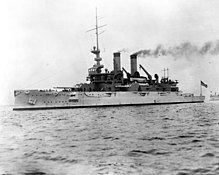 Naval vessel patrolling along the coastline of Yemen enforcing the American-Saudi blockade against Iran. ^ The Nation. J.H. Richards. 1889. pp. 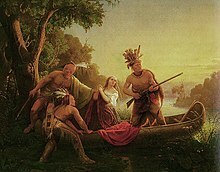 256–. 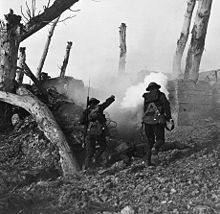 ^ "History: World War I". ^ Mujaju 1987, p. 484. ^ "Communist Insurgency In Thailand" (PDF). CIA Report. Retrieved 1 December 2014. ^ a b "Anatomy of a Counterinsurgency Victory" (PDF). January 2007. Retrieved 1 December 2014. ^ "Statement by Deputy Press Secretary Larry Speakes". September 23, 1982. ^ "The Collapse of Lebanon's Army: U.S. Said to Ignore Factionalism". March 11, 1984. ^ Cambridge Scholars Publisher (2015). Coercive Diplomacy of NATO in Kosovo. Cambridge Scholars Publishing. pp. 289–. ISBN 978-1-4438-7668-1. ^ "The operation was essentially a failure" (Bergen 2002, p. 124)"... The highly unsuccessful Operation Infinite Reach ... backfired and acted as a recruitment drive for bin Laden's Al Qaeda" (Williams 2017, pp. 52-53)."... The failed strikes were dubbed Operation Infinite Reach ... the missile attacks exposed the inadequacy of American intelligence and the futility of military power" (Wright 2006, p. 285). Zenko (2010, p. 139) judges Operation Infinite Reach to be both a political and military failure. ^ Petrou, Michael (9 September 2011). "The decline of al-Qaeda". Maclean's. George W. Bush gambled on surging thousands more troops to the embattled country. It paid off. Al-Qaeda in Iraq is now a diminished force without territory. ^ South, Todd (2019-01-20). "Armyâ€™s long-awaited Iraq war study finds Iran was the only winner in a conflict that holds many lessons for future wars". Army Times. Retrieved 2019-01-20. ^ Galbraith, Peter W. (2007). The End of Iraq: How American Incompetence Created a War Without End. Simon & Schuster. p. 74. ISBN 978-0-7432-9424-9. ^ "How to Stop Iran's Growing Hegemony". National Review Online. ^ "The JRTN Movement and Iraq's Next Insurgency | Combating Terrorism Center at West Point". Ctc.usma.edu. Archived from the original on 2011-08-26. Retrieved 2014-08-02. ^ a b c "Service and Sacrifice: Ugandan 'Blue Helmets' support UN efforts to bring peace to Somalia". UN News. 2019-04-18. Retrieved 2019-04-18. ^ Somalia, EUTM. "Home". EUTM-Somalia. Retrieved 2019-04-18. ^ "Somali piracy is down 90 per cent from last year". The Journal. 15 December 2013. Retrieved 14 January 2014. ^ Holmes, Oliver (24 January 2012). "UPDATE 1-Anger, chaos but no revolt after Libya violence". Bani Walid. Reuters Africa. Retrieved 24 January 2012. ^ Baddorf, Zack (20 April 2017). "Uganda Ends Its Hunt for Joseph Kony Empty-Handed". The New York Times. ISSN 0362-4331. Retrieved 21 April 2017.